‘Bloodtide’ brings with it another of Doctor Who’s classic recurring villains, this time giving the Silurians their welcome to the audio format. The Silurians have one of the richest cultures and histories in Doctor Who, but the relatively few stories involving them have not done much to explore their prehistoric but technologically advanced culture that entered cryogenic suspension to survive the presumed impending damage to Earth by a celestial body that eventually became the Moon. ‘Bloodtide’ takes advantage of that opportunity in 1835 as the Sixth Doctor brings Evelyn to the Galapagos Islands and the HMS Beagle to meet Charles Darwin, one of her idols. As Evelyn does her best to not interfere with Darwin’s studying of finches, the Doctor soon becomes aware of a governor of a local penal colony who is jailing citizens for only the most minor of offences. The governor has made a deal with an unknown species, eliminating ‘undesirables’ so they may become food or experiment fodder. Unfortunately, this is one of the cases where having Evelyn split from the Doctor actually impedes any sort of character development. Evelyn is all too aware that she cannot help Darwin in formulating his theory on evolution, and so she is relegated to simply politely agreeing or disagreeing as needed without actually giving any thoughts of her own. Evelyn is a strong character and the perfect companion for Colin Baker as evidenced when they are together, bantering away and displaying an intrinsic trust with each other, and it’s a shame that she is essentially sidelined for so much of the tale. Colin Baker fares much better, though, and he is allowed to show a wide range of emotions to further broaden his appeal to Big Finish listeners. He effortlessly switches from rage as he learns of Governor Lawson’s deal to tempered diplomacy as he tries to convince the Silurians that they can live in peace with the humans. He’s unwavering in his devotion to the humans but realizes that both species have a unique opportunity to make cohabitation possible. The Silurians, happily, make a fantastic transition to audio. Tulok, the Silurian scientist who was banished for committing the sin of experimenting on humans in order to obtain both servants and food for his race, got his revenge on his people by sabotaging the timing mechanism on their hibernation system. Daniel Hogarth performs admirably as the disdainful scientist, aptly exuding pride and arrogance as he condescendingly disparages the humans and derides Darwin’s theory. On the other hand, Tulok’s assistant Shvak undergoes quite the emotional journey as he realizes that he may have doomed his race by helping Tulok return from banishment. In a surprising turn of events, the Myrka returns after last being seen in ‘Warriors of the Deep,’ and ‘Bloodtide’ actually does a reasonable job in redeeming the creature. As well as the Silurians are written, though, and the author clearly has a lot of love and respect for them, the human characters are mundane and do little to stand out. This unfortunately pertains even to the central conflict as Darwin tries to accept evolution in the face of his religious beliefs. Whereas a very interesting conflict of science versus faith could have easily been written, that inner turmoil is instead trimmed to a bare minimum due to the running time of the play and essentially turns to Darwin proclaiming the lack of a god in the world. It’s an unsuccessfully brief personal journey that simply needs more time to prove itself. In the end, ‘Bloodtide’ successfully brings the Silurians in the audio format and the revelation that they helped guide human evolution shows just how much there is to explore with their race. 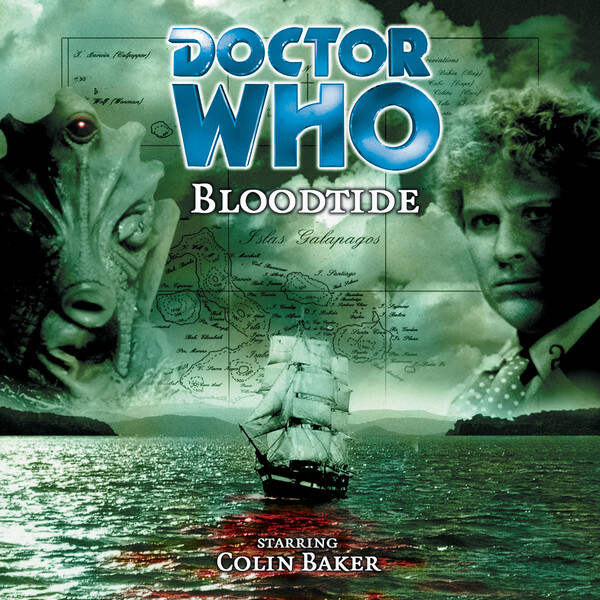 The sound design and production values are of the usual high calibre, and although the script falters in developing the human characters and the Darwin’s inner turmoil, ‘Bloodtide’ is still a very enjoyable tale in Colin Baker’s expanding list of adventures.